One of my favorite investors is Warren Buffett and I own his company Berkshire Hathaway (BRK-B). 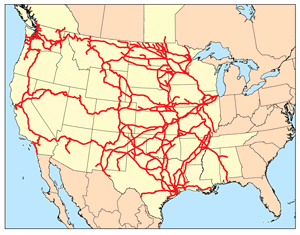 Berkshire owns BNSF Railway according to their website is a product of 400 different railroad lines over the last 160 years that have merged or were acquired. After studying Warren Buffett I know he understands and respects the history of the railroads. In my book review video of Harriman vs Hill: Wall Street's Great Railroad War one of the reviews was from Buffett, he said, "I first read about the Northern Pacific Corner when I was ten years old. When I opened my office on January 1, 1962, I put on the wall a framed copy of the New York Times of May 10, 1901, describing the fateful prior day. Larry Haeg now tells the full story, and I enjoyed every word of it." —Warren Buffett I know BNSF Railway is only a small part of the overall Berkshire conglomerate. The Railroad, Utilities, and Energy make up only (19% of revenue). In my opinion he was waiting for the perfect time in history to acquire this prestigious railroad line once owned by the Business Legend James J. Hill, he made a great addition and perfect timing in the 2010 acquisition. I also recently invested in Canadian National Railway (CNI) a new holding that is the only transcontinental railway in North America. This is a holding in Bill Gates stock portfolio. CNI is the largest railroad in Canada in physical size and revenue. The company continues to raise its dividend with 19 consecutive dividend increases with dividends paid since 1996. A ratio I like to always factor is the payout ratio CNI has a 47% payout ratio. The DGR has been 18.27% over the last 5 years. The bottom line is the company has been run well. Revenue is spread out and not dependent on one industry. The photo below will give an idea of the size of the line! Just like I do when I buy oil stocks I love to research the rich history of the industry and companies. As a retail "small" investor I always talk about how we have the advantage of being nimble. We can buy and sell a companies shares without anyone noticing and usually liquidity is never a problem. Our work is to use the company website, financials, following financial journalists, and investors that follow the company. We make our money with dividends, spin-offs, or selling for a gain. I would say the hardest part is patience letting the story unfold after research and our thesis is made. We can't get emotional and if the story changes we must sell or buy protection. As a retail investor we can't buy enough to make waves if changes need to be made. The only way to voice our displeasure is to sell. This type of investment is a bullish sentiment on the future! If you like this blog entry you might also like Amazing History of Oil!